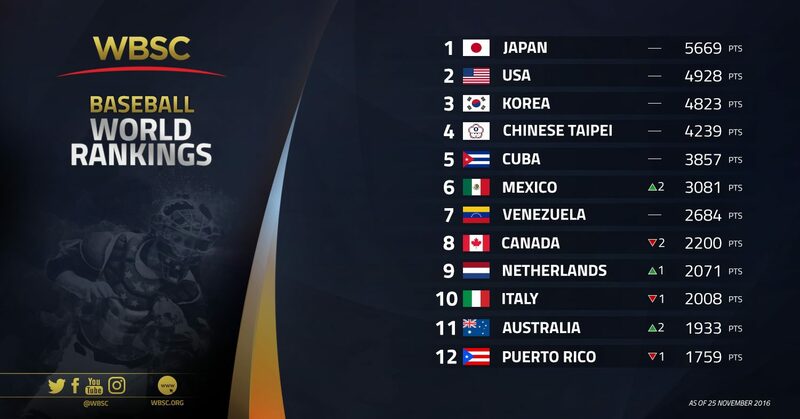 （November 25, 2016）LAUSANNE, Switzerland -- The World Baseball Softball Confederation today unveiled the updated 2016 standings in the Official WBSC Baseball World Rankings, which weigh a country's entire National Team programme (from U-12 to Professional) in international competition over a four-year period (2013-2016). Five continents, Asia, Europe, North and South America, and Oceania, are represented within the Top 12 -- the critical cutoff (in 2018) for qualifying for the flagship PREMIER12® 2019, which will be a main qualifier for the Olympic Games Tokyo 2020. Japan has extended its lead as the top-ranked baseball nation after having earned the title of world champion in the U-23 category by winning the U-23 Baseball World Cup 2016 in Monterrey and Saltillo, Mexico, earlier this month. The world title in Mexico, along with 1st Place at the U-18 Asia Championship in September, has propelled Japan's lead over No. 2 United States from 62 points to 741 points.